The American movie studios dug into the television archives with gusto in the 1990s, cherry-picking franchises familiar from countless TV reruns for big-screen treatment. Rarely have the results been more entertaining than in director Barry Sonnenfeld's inventive takes on The Addams Family, an oddball chestnut from the Filmways catalog that ran for two years on ABC, beginning in 1966. 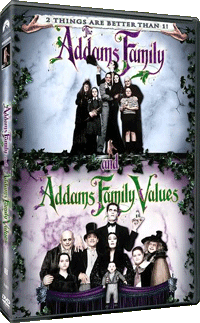 Hilariously inventive and brilliantly cast, The Addams Family ('91) and its less successful but still fun-filled sequel Addams Family Values ('93) are proof that there is, perhaps was, gold to be mined in the old TV vaults. Inspired more by the 1960s TV series than by the original Charles Addams New Yorker cartoons, The Addams Family proved to be one of the more successful of the TV shows-turned-movies of the 1990s. The film opens on a recreation of the magazine cartoon wherein the ghoulish Addamses prepare to pour hot oil upon a group of merry Christmas carolers. After a series of vignettes which establish the characters of Gomez (Raul Julia), Morticia (Anjelica Huston), Wednesday (Christina Ricci), Pugsley (Jimmy Workman) and family servants Lurch (Carel Struycken) and Thing (Christopher Hart), the plot proper gets under way. A stranger, played by Christopher Lloyd, shows up on the Addams doorstep, claiming to be long-lost Uncle Fester. It appears, however, that Lloyd is a ringer, in cahoots with attorney Tully Alford (Dan Hedaya) to strip the Addamses of their fortune. In their usual against-the-grain fashion, the Addams Family seems to delight in the possibility that they're being hoodwinked-indeed, not even kidnapping or death threats dampen the Addams clan's joy of living (or should we say dying?). The Addams Family served as the directorial debut of cinematographer Barry Sonnenfeld. The ghoulish cartoon family created by Charles Addams returns for a second big-screen outing darker and nastier than the first. When Morticia Addams (Anjelica Huston) gives birth to new baby boy Pubert, the other Addams children, Pugsley (Jimmy Workman) and Wednesday (Christina Ricci), devise any number of ways to kill off their new sibling. This leads Morticia and her husband, Gomez Raul Julia, to hire a nanny (Joan Cusack) to oversee all three children. But the nanny has an agenda of her own, packing the Addams children off to a horrid parody of summer camp and setting out to seduce Uncle Fester (Christopher Lloyd), all with the goal of getting her hands on the Addams family fortune. Of course, the Addams eventually triumph, with this blacker-than-most satire extolling the virtues of eccentricity and non-conformity above all. It was followed by 1999's direct-to-video Addams Family Reunion, with Darryl Hannah and Tim Curry replacing Huston and the late Julia.